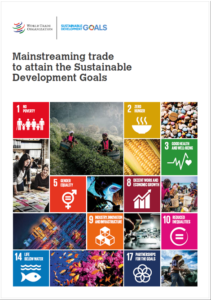 This report identifies ten steps that would help to ensure that international trade contributes to accelerating progress in achieving the Sustainable Development Goals. Trade has a key role to play in meeting the United Nation’s 2030 Agenda for Sustainable Development and its Sustainable Development Goals (SDGs). Historically, trade has proven to be an engine for development and poverty reduction by boosting growth, particularly in developing countries. By increasing growth, trade can also make available the necessary resources to implement other development targets in the social and environmental sphere.